His strength is his Ohio record, not his tendency to moralize. John Kasich joined the Republican presidential cavalcade on Tuesday, making the candidate total 16. If primary voters are spoiled for choice, the Ohio Governor and former nine-term Congressman deserves some notice. Mr. Kasich has a capable record in the Buckeye State and as House Budget Chairman in the 1990s, as well as the potential to appeal across the GOP coalition. The question is whether he can overcome his political idiosyncracies and frequent self-control outages. In 2010 Mr. Kasich narrowly unseated incumbent Democrat Ted Strickland to manage a former industrial powerhouse in crisis—the deficit hit $8 billion, the rainy-day fund had all of 89 cents and Ohio GDP had grown at a rounding error near 0% for a decade. An early effort to reform collective bargaining and curb public union power that was tougher than Scott Walker’s in Wisconsin was repealed in a landslide popular referendum. Yet Mr. Kasich won re-election in 2014 by 31 points, carrying 86 of Ohio’s 88 counties. In a word, voters rewarded the results of Mr. Kasich’s pro-growth agenda. The jobless rate has fallen to 5.2% from 9.1% when Mr. Kasich took office, while median household income has climbed 1.3% versus 0.6% nationally. The state fisc is now running a surplus. The Ohio economy has been lifted by a surge in high-tech jobs and the fracking boom in the Marcellus and Utica shales in eastern Ohio, but Mr. Kasich’s policies also deserve credit. In a series of across-the-board tax cuts, he has lowered the top marginal income tax rate to 4.9% from 6.2% in 2011. 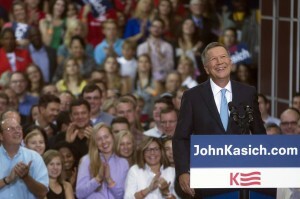 Mr. Kasich modernized the arthritic Ohio bureaucracy and his regulatory reforms have improved state competitiveness. All of this will be familiar from Mr. Kasich’s career in the House, where he was a key Newt Gingrich ally. Less consistent with this resume is Mr. Kasich’s 2013 decision to participate in ObamaCare’s Medicaid expansion. When Republicans in the Ohio legislature tried to block this gambit, Mr. Kasich imposed new Medicaid unilaterally through an executive panel. He then became the leading Republican evangelist for ObamaCare’s Medicaid expansion and accused anyone who disagreed with him of bad faith—literally. As the Governor often put it, when you get to the pearly gates St. Peter won’t ask you what you did to keep government small but he will ask you what you did to help the less fortunate. Mr. Kasich’s badgering moralizing is one of his less attractive qualities, and his unfiltered streams of political consciousness. If Mr. Kasich is also running to lecture Republicans about everything they’re wrong about, he’ll lose too, and he might as well pack it in now. Then again, no Republican has ever won the White House without carrying the swing state of Ohio, and perhaps Mr. Kasich can take his Buckeye successes national. He’s more likely to find an audience if he underscores his record and economic ideas rather than his moral superiority.